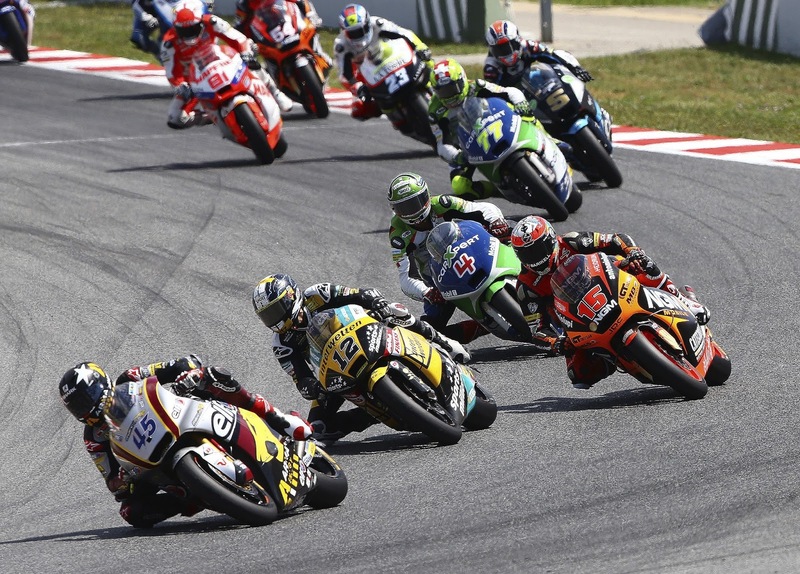 Moto2 & Moto3 Catalunya Round-up: Tactical Salom and Espargaro wins the battle of the team-mates. Moto3 began the action with a well timed win by Luis Salom for the Red Bull KTM Ajo team. Once again the lightweight class was Spanish and KTM dominated as Salom picked the right moment to power away to back-to-back wins after also seizing victory in Mugello two weeks ago. He was joined on the podium by Estrella Galicia rider Alex Rins who despite his best efforts could not pass his rival, and Team Calvo’s Maverick Vinales who had to settle for third. Salom also leaves Spain with the championship lead, in front by five points from Vinales, with both riders making the podium at every round so far. Alex Marquez was dropped in the closing stages and finished fourth for the Estrella Galicia team ahead of a hard battling Efren Vazquez, who was back on form on his return for Mahindra and comfortably ahead of his team-mate Miguel Oliveira who was next across the stripe. Jack Miller was the first Honda to finish in seventh for Caretta Technology after having a long fight for position with Oliveira. Eighth place was hotly contested but eventually taken by Alexis Masbou, just ahead of Red Bull’s Zulfahmi Khairuddin and Arthur Sissis. Also scoring points were Isaac Vinales in 12th and Ambrogio team riders Brad Binder in 12 and 14th sandwiching CIP’s Alan Techer in 13thplace. Romano Fenati took the final point. John McPhee finished 19thfor Caretta Technology. Moto2 was a battle to the end for Tuenti HP 40 team-mates Pol Espargaro and Tito Rabat, with Espargaro holding on for the win, his second from pole this year after Qatar. Tom Luthi looked to be fully recovered from injury with an assured performance on his Interwetten Paddock machine placing him on the final spot on the podium. Brit Scott Redding made the best of a tough weekend, and despite topping warm-up after an engine change settled for fourth for Marc VDS. He still leads the championship, with Espargaro moving into second in the standings. Italtrans rider Takaaki Nakagami and Technomag’s Randy Krummenacher had a long duel with the Japanese rider being the victor in fifth. Seventh went to Johann Zarco, ahead of the second Technomag bike powered by Domoinque Aegerter in eighth. Marc VDS’s Mika Kallio battled to ninth, with Simone Corsi completing the top ten for Forward Racing just ahead of his team-mate Mattia Pasini. Mike Di Meglio took 12th for Jir as Danny Kent scored his first points for Tech3 in 13th. Axel Pons put all the Tuenti team bikes in the points despite an in-race penalty where he was ordered to drop a place for an illegal manoeuvre. Julian Simon took the final point in 15th. Brit Kyle Smith finished in 17thfor the Blusens Avintia team.